FOR AVAILABILITY PRIOR TO PURCHASING. All of Our Products are New and Guaranteed! French Scroll Wall Planter With Basket! Hand Forged Wrought Iron. Comes With Planter Box. Dimensions: Iron Planter__36L x 11D x 11H. It is the love for the traditional craft and meticulous attention to detail that make this collection unique. Each of our handmade items reflects the skill and dedication to quality of the craftsman who work on them. All of our products are shaped by heating and hammering solid iron. No part is hollow tubing, or aluminum castings. Each piece is considered “one-of-a-kind” and comes with its unique characteristics. Our Limestone is hand cut from Egypt. This attention to detail takes more time, and is more difficult to produce. Our products are a bit more expensive, but are crafted for those who want real things. It is this relentless effort that sets us apart from our competition. The results are heirloom quality products that will be enjoyed for many years to come. PLEASE VIEW OTHER ITEMS IN THIS LINE. Our Hand-built artisan creations promise heirloom quality, beauty, and elegance that make it worth the wait. After all, we don’t settle for anything less than perfection in the construction of custom pieces, and neither should you. About European House & Mallery Hall. The Mallery Hall company searches the world over to find fantastic collections of New and Old World treasures. We handpick our collections from United States, Europe, and the Far East. The majority of our products are designed and manufactured as antique reproductions and are made of solid wood constructions. Using traditional construction techniques, including pegged mortise and tenon joints, dovetailing, parquetry and hand carving. We offer a more high quality furniture at affordable prices. Each piece is carefully finished to create the patina of fine antiques with fittings appropriate to its style and period. Primary wood species include Mahogany, Oak, Pine, Teak, Alder, Rubberwood, and Birch. Some of our finishes maintain a certain distressed and antiquated look. As such, slight variations in dimension or finish can be expected. Solid wood furniture is affected by humidity and atmospheric pressures, so it continually responds to its environment. Some splitting, cracking, warping, or other movement of wood components may occur. All of these factors are non-structural and are part of achieving the authentic nature and emotional appeal of these products. Don’t see what you want… Us and we will try to find it for you! We appreciate your business. But due to the nature of custom-built furniture, our prices are non-negotiable. We research furniture pricing trends and pride ourselves in offering fair and competitive pricing. Your questions will be answered in the order they are received. Check with us regarding customer financing options! Please note that if you are ordering three or more pieces its possible we can offer a discount depending on the items and as long as all pieces are going to the same destination. All items are inspected prior to leaving manufacturers and are in excellent and new condition. We do however guarantee you will receive your items in the condition as described. Us for authorization prior to returning any piece. The free listing tool. 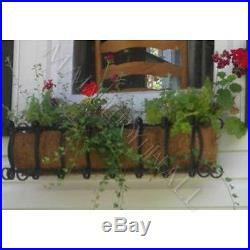 The item “Wrought Iron Scrolled Long Window Basket” is in sale since Friday, June 21, 2013. This item is in the category “Home & Garden\Yard, Garden & Outdoor Living\Patio & Garden Furniture\Swings”. The seller is “malleryhall” and is located in Loganville, Georgia. This item can be shipped to United States.